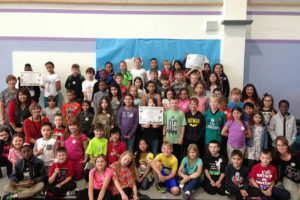 Students from Netzaberg Elementary School who participated in the contest. GRAFENWOEHR, Germany — The Environmental Division’s first annual ‘Experience Spring’ contest has wrapped up and the winners have been announced. Eight teachers submitted entries from Netzaberg, Vilseck and Hohenfels Elementary Schools. The purpose of the contest is to encourage children to explore nature and learn about local German plant and animal species. The contest focused on four spring harbingers: the common grass frog, common nettle, European goldfinch and peacock butterfly. Next year, there will be four different species as the official signs of spring. Participants were encouraged to get creative in exploring and discovering each species, then compile their efforts for their contest submission. Environmental Division staff got the idea for the contest from the Erlebter Frühling contest held by Naturschutzbund Deutschland (NABU), a German environmental non-governmental organization. The Environmental Division plans to compile all the garrison entries and send a USAG Bavaria-wide submission to NABU’s Erlebter Frühling contest to show the American military’s commitment to protecting our environment. Judging was based on criteria such as creativity, originality and long-term impact on student learning. Four winner categories were awarded: Creative Writing, Scientific Research, Performing Arts and Cooperation with Partners. Grand prize in the Creative Writing category was awarded to Sheila Reed and Kimberly Martin’s class, a third grade group from Netzaberg Elementary who got creative by writing poems and making paintings. They then produced a video of each student reading their poem and showing off their artwork. Grand prize in the Scientific Research category went to Ms. Sandee Roberts’ Netzaberg Elementary third grade class who observed, photographed and measured common nettle growing by the school for five weeks and kept scientific journals. Students harvested the nettles and made tea, as well as learned about human and animal uses of nettles. Runner-up in the Scientific Research category went to Griselda Ready and Kim Martin’s Netzaberg Elementary third grade class for creating informational presentations on each of the four spring signs. Grand prize in the Performing Arts category went to Margaret Ballinger’s Netzaberg Elementary third grade class who created informative posters about each spring sign and then showed off their posters in a fun, dance filled music video. Runner-up in the Performing Arts category went to Hohenfels Elementary School for creating peacock butterfly masks and then arranging around 200 students for a group photo in the shape of a butterfly as a part of their Earth Day celebration event. Grand prize for the Cooperation with Partners category went to Patty Hall, Amy Dachser and Laurie William’s third grade classes from Vilseck Elementary for teaming up with a German class from Grund-und Mittelschule Vilseck to create spring sign collages for a wall habitat and playing a bilingual spring bingo game. Netzaberg Elementary School won a set of European nature identification books for being the school with the most participating classes. “Congratulations to all the students and teachers who participated. We are impressed with the quality of learning and hard work put into this project by the students and teachers. A big plus is that they looked like they had fun while doing it! Next year we hope to get families and youth organizations like Girl Scouts involved in the contest,” said Caecilia Kastl-Meier, Environmental Division staff member.